1. 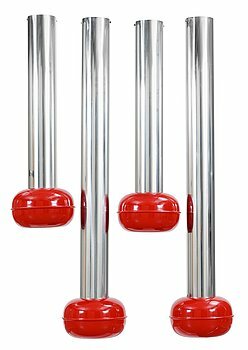 A set of four Ettore Sottsass 'Mefistole' ceiling lamps by Stilnovo, Italy 1970's. 2. 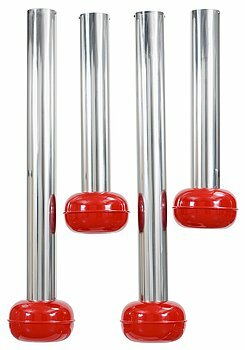 A set of four Ettore Sottsass 'Mefistole' ceiling lamps by Stilnovo, Italy 1970's. 3. An Ettore Sottsass 'Ivory' glass and plastic laminate occasional table, Memphis, Italy. 4. 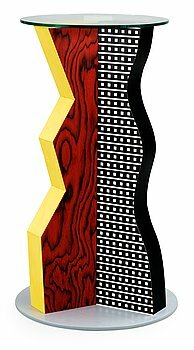 An Ettore Sottsass 'Diva' mirror, Memphis, Italy. 5. A Martine Bedin 'Splendid' enamelled steel and aluminium floor lamp, Memphis, Italy. 6. A Piero Fornasetti umbrella stand, Milan, Italy. 7. 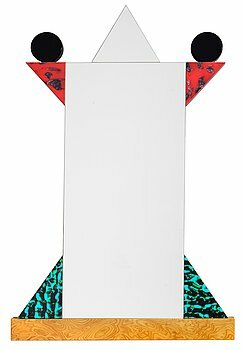 A Piero Fornasetti umbrella stand, Milano, Italy. 8. 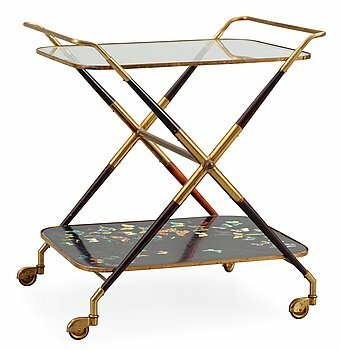 A Piero Fornasetti butterfly trolley, Italy, 1950's. 9. 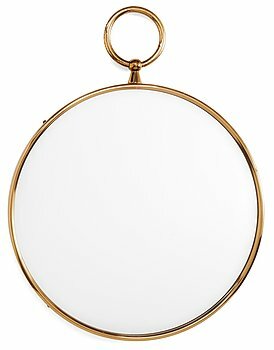 A Piero Fornasetti brass mirror, Italy 1950's. 10. Two Piero Fornasetti table lamps, Milano, Italy. 11. A set of three Piero Fornasetti 'Astro Labio' porcelain plates and six gilded dishes, Milan, Italy. 12. A set of nine Piero Fornasetti 'Sun and Moon' plates, Milano, Italy. 13. 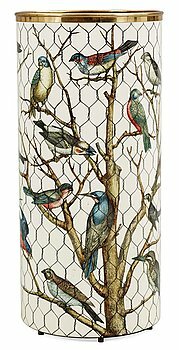 A Piero Fornasetti umbrella stand, Milan, Italy. 14. A black lacquered iron, brass and marble floor lamp, attributed to Stilnovo, Italy 1950's. 15. A black lacquered iron and brass floor lamp, attributed to Stilnovo, Italy 1950's. 16. A brass and marble floor lamp, attributed to Stilnovo, Italy 1950's. 17. A Studio Simon 'Omaggio ad Andy Warhol' stool from the 'Ultramobile' collection, designed in 1973. 18. A pair of Gae Aulenti 'Pipistrello' white lacquered steel and plastic table lamps by Martinelli Luce, Italy. 19. An Achille & Pier Castiglioni 'Arco' marbel and aluminium floor lamp. 20. A Jonathan De Pas, Donato D'Urbino & Paolo Lomazzi three seated green leather 'Onda' sofa, Zanotta, Italy. 21. A Jonathan De Pas, Donato D'Urbino & Paolo Lomazzi three-seated 'Onda' grey leather sofa, Zanotta, Italy. 22. A Gino Sarfatti hanging lamp modell 2097, Flos Italy. 23. An aluminium wall-lamp attributed to Mario Torregiani, Italy 1980's. 24. A Gae Aulenti glass and rubber wheel sofa table, 'Tavolo con Ruote', Fontana Arte, Italy. 25. An Antonio Citterio sofa "Harry" for B & B Italia, Italy. 26. An Antonio Citterio sofa "Charles" for B & B Italia, Italy. 27. A Tom Dixon 'S-Chair' by Cappellini, Italy. 28. A Hertha Bengtsson 111 pcs 'Blå Eld' creamware dinner service, Rörstrand. 29. A Stig Lindberg enamel and beech sofa table, Gustavsberg 1950's. 30. A Stig Lindberg enamel and oak sofa table, Gustavsberg 1950's. 31. A set of eighteen Stig Lindberg creamware plates 'Löja', Gustavsberg 1948-62. 32. A palisander cabinet, probably by Svante Skogh, Seffle, Sweden 1960's. 33. A Sigurd Persson 18 light brass chandelier, Sweden 1960's. 34. An Erik Höglund set of a painted wooden bureau, a mirror and a table lamp, Eriksmålaglas, Eriksmåla, Sweden 1960's-70's. 35. A Bertil Vallien iron and glass twelve light chandelier, Boda Smide, Sweden, probably 1960's. 36. An Henrik Thor-Larsen 'Ovalia' easy chair, Torlan, Staffanstorp, Sweden 1960's-70's. 37. A Bruno Mathsson & Piet Hein palisander and chromed steel dinner table, Fritz Hansen, Denmark. 38. A Jonas Bohlin 'Concrete' armchair, Källemo, Värnamo, Sweden 1981. 39. A Jonas Bohlin daybed 'Concav' in black lacquered beech and black leather by Källemo, Sweden 1985. 40. A Jonas Bohlin 'Sto' iron and oak chair, Stockholm 1990. 41. A Jonas Bohlin 'Concrete' armchair, Källemo, Sweden 1981. 42. A Jonas Bohlin 'Concrete' sofa table, Källemo, Värnamo, Sweden. 44. A John Kandell black lacquered metal and black leather easy chair, 'Singel', Källemo, Värnamo, Sweden 1982. 45. A Mats Theselius 'Rörligt Objekt' copper room divider by Källemo, Sweden post 1989. 46. A Mats Theselius 'Aluminium' birch bark and aluminium easy chair, by Källemo, Sweden circa 1990. 47. A Mats Theselius easy chair 'Älgskinnsfåtöljen' by Källemo Sweden 1991. 48. A Mats Theselius 'The Ritz' black lacquered steel and green leather armchair, Källemo, Värnamo, Sweden 1994. 49. A Mats Theselius 'The Ritz' black laquered steel and green leather armchair, Källemo, Värnamo, Sweden 1994. 50. A Mats Theselius 'Theselius Rex' iron and brown leather armchair by Källemo, Sweden, post 1995. 51. A Mats Theselius 'El Rey' brass and leather easy chair, Källemo AB, Värnamo, Sweden. 52. A Mats Theselius 'Aluminium/Theselius' aluminium and white leather easy chair, Källemo. 53. A Mats Theselius aluminium and leather 'Aluminium/Theselius' armchair, Källemo. 54. A pair of Mats Theselius 'Aluminium/Theselius' aluminium, birch and leather armchairs, Källemo AB. 55. An Alf Linder iron and glass table, decorated with a photo and salt, by Källemo, Värnamo, Sweden 1995. 56. A Sigurdúr Gustafsson 'Keflavik' sofa executed by Källemo, Sweden 2000. 57. An Arne Jacobsen brown leather 'Egg' chair and ottoman, Fritz Hansen, Denmark 1963. 58. An Arne Jacobsen black leather 'Egg Chair', Fritz Hansen, Denmark 1964. 59. An Arne Jacobsen black leather 'Egg' chair, Fritz Hansen, Denmark 1960's. 60. An Arne Jacobsen 'Series 7' desk chair by Fritz Hansen, Denmark 1963. 61. A set of six Arne Jacobsen palisander 'Ant' chairs, Fritz Hansen, Denmark 1950's-60's. 62. A set of six Hans J Wegner chairs, Johannes Hansen, Denmark 1950's, model 701. 63. A Hans J Wegner 'Bamse' easy chair, AP-stolen, Denmark. 64. A Hans J Wegner 'Bamse' easy chair, AP-stolen, Denmark. 65. A Hans J Wegner palisander and steel 'AT 319' dinner table, Andreas Tuck, Denmark 1960's. 66. A pair of Hans J Wegner cherrywood 'China' armchairs, Fritz Hansen, Denmark 1966. 67. A pair of Hans J Wegner cherrywood 'China' armchairs, Fritz Hansen, Denmark 1966-67. 68. A Hans J Wegner cherrywood 'China' armchair, Fritz Hansen, Denmark 1966. 69. A Poul Henningsen white lacquered 'Artichoke' ceiling lamp, Louis Poulsen, Denmark. 70. A Poul Henningsen white lacquered 'Artichoke' hanging lamp, Louis Poulsen, Denmark. 71. A pair of Poul Henningsen copper 'PH' wall lamps, Louis Poulsen, Denmark. 72. A Piet Hein black laquered metal and brass seven light candelabrum, 'Ursa Major', 1950's-60's. 73. A Verner Panton 'VP-Globe' hanging lamp, Louis Poulsen, Denmark. 74. A Hans J Wegner ash and teak 'Peacock chair', Johannes Hansen, Denmark. 75. A pair of Hans J Wegner easy chairs by Carl Hansen & Son, Denmark. 77. A Finn Juhl palisander and beech chair, by Bovirke, Denmark 1950's-60´s. 78. A Hans J Wegner 'Ox-Chair', by Erik Jørgensen, Denmark 2008. 79. A set of six Hans J Wegner 'Kastrup' steel and black leather chairs, AP-stolen, Denmark. 80. A pair of Hans J Wegner 'Kastrup' steel and black leather chairs, AP-stolen, Denmark. 81. A Hans J Wegner oak and black leather daybed, Getama, Denmark 1950's-60's. 82. A Poul Kjaerholm set of occasional tables, 'PK-71', E Kold Christensen, Denmark. 83. A Poul Kjaerholm 'PK-61' steel and slate sofa table, E Kold Christensen, Denmark, maker's mark in the steel. 84. A pair of Poul Kjaerholm 'PK-22' steel and black leather easy chairs, Fritz Hansen, Denmark 1992. 85. A pair of Poul Kjaerholm 'PK-22' steel and ratten easy chairs, E Kold Christensen, Denmark, maker's mark in the steel. 86. A Poul Kjaerholm 'PK-91' steel and brown leather stool, Fritz Hansen, Denmark. 87. A Poul Volther steel and black wool 'Corona' easy chair by Erik Jørgensen, Denmark. 88. A Poul Volther steel and black wool 'Corona' easy chair by Erik Jørgensen, Denmark. 89. An Ole Wanscher mahogany desk by A.J Iversen, Denmark 1950's. 90. A pair of Ole Wanscher palisander 'Colonial Chair, PJ 149', Poul Jeppesen, Denmark. 91. An Ole Wanscher palisander 'Colonial Chair', PJ 149, by Poul Jeppesen, Denmark. 92. A Poul Henningsen white lacquered 'Artichoke' hanging lamp, Louis Poulsen, Denmark. 93. A Poul Nørreklit palisander and plexi glass desk, Sigurd Hansen, Denmark 1960's. 94. A Nørreklit black leather sofa on chromed steel base by Selectform, Denmark 1960's. 95. An Aksel Kjersgaard palisander table with mirror, Denmark 1950's-60's. 96. A pair of Ib Kofod Larsen teak and brown leather easy chairs, OPE Möbler, Sweden 1960's. 97. A Johannes Hansen 'Capri' sofa and armchair by Trensum 1950's-60's. 98. A Johannes Hansen 'Capri' teak sofa table by Trensum 1960's. 99. An Erik Magnussen chromed steel and black leather 'Zdown' chair, Engelbrechts, Denmark. 100. A Pierre Guariche brass and black lacquered metal 'Equilibrium' floor lamp, France 1950's. 101. Tapio Wirkkala, A Tapio Wirkkala laminated birch leaf dish, Finland 1950's.